In short, I could not study very well that night. After that, Satori went into my. . . Ayumi's room, and she did vice versa. When in their own room, each of them is more easily able to manifest their ability, so Ayumi could more easily transform her. Satori brought her own fashion-magazines into the room, showed off some fashion-styles in the magazines and called on one of their brand-names. Just calling upon it turned a lively high-school girl into a refreshing high-school boy, clad in an appealing outfit, which (of course) just came from the fashion-magazines. I cannot explain it but it is a weird reaction. Satori, when turned into a boy, does not have very consistent "reactions" or "behaviors". Nowadays, no one says "--daze"1. It is not too unnatural, for my sister does not use "word-changes for women" intentionally, but I cannot say her word choices are completely normal, for she uses "I"2 when referring to herself. "How is this? Brother? Do not you think I am attractive?" ". . . I think so." Even girls' fashion does not interest me very much, so it is much more annoying to be made to appreciate the men's "appealing style", being shown. Not only difficult to say. But also difficult to express. "Well. . . let me see." Yes, even though he was physically a boy now, the cute way of acting, the very essence of his character, could not be wiped out that easily. Satori's way of posing to show off his fashionable clothes (for boys) . . . his body twisted at his waist and one of his legs lifted up. . . was completely "girlish". Though it was not certain to Ayumi that his appearance was one of her favorites, though, it might be "one of her likes" since the appearance was "androgynous", though it made her unsettled. "Huh, sorry-sorry. I could not help doing that." He looked innocent since he was clearly smiling, but it proved that he was "a boy". "Well, at least we found out that each of us can more easily transform the other when in their own room." Satori looked quite proud, with an "Aha!" expression, without any reason. "So you had also better be careful, brother. . . No, watch yourself! Bro!" Though he is trying to act just like 'a boy', he seems more like a female member of some drama club. It arouses quite mixed feelings in me, for his act makes him attractive. "Anyway, brother, don't you feel bad when you are alone with a guy in your room?" ". . . I don't think so." "Hey now, don't deny it!" No sooner had Satori spoken than Ayumi felt uncomfortable from face to foot. At the same time, Ayumi felt the freedom of her legs. It was obviously a skirt. "So, we had better be a guy and a gal." ". . . And I am a gal." "Well, I think it is more natural." Though she did not know the name of it, Ayumi was also clad in a cute outfit, which had just come from a fashion-magazine. The mini-skirt, as short as hot-pants, was the point of it (What point?). "Brother, you should also got a mirror. Don't you feel disappointed?" "I have no money to buy one." "Ah, I did not buy that one, didn't you know?" 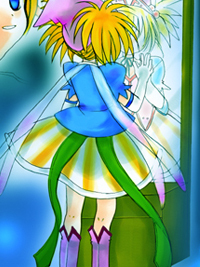 She meant the full-length mirror in Satori's room.